Multor Kaston wrote a short essay about his reaction to MinerBumping. It was a nice read, but it made me wonder what happened to him to make him write this. Was he bumped in an ice anomaly? Ganked in an asteroid belt? He's wrong about there being no EVE therapists, but there's more than one way to work through one's anger. I meet a lot of new people in my line of work, so I'm always armed with a prepared statement to help get things off on the right foot. It isn't 100% effective, but what is? Over the past year, there have been several instances of carebears getting kicked out of their corps when the corp leaders are informed of crimes committed against the New Order. By contrast, I know of only one miner who was mistreated for following the Code, and that conflict was successfully resolved. It's true, MinerBumping is approaching its one millionth hit in less than a year. But that doesn't mean I'll sell out or get involved in RMT. I am a strong believer in earning money in an honest, honourable fashion. 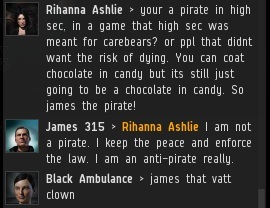 I'm amused to see carebears threaten to hire pirates to fight the New Order. 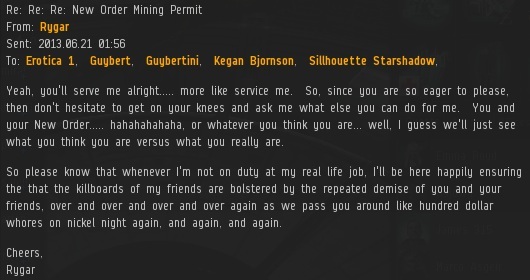 Highsec mercenaries aren't in a good position to fight us, now that they have been all but nerfed out of existence. 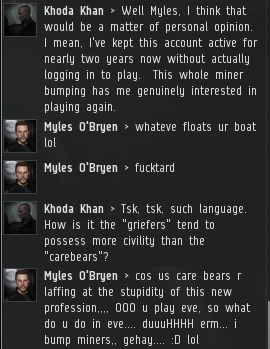 Maybe the carebears should have thought of that before begging CCP for all those nerfs. 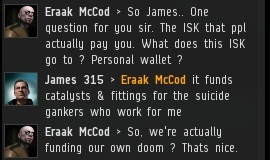 To be clear, miners who give isk to the New Order aren't funding their own doom--they're funding the doom of their unscrupulous competitors. Money well spent! Rygar has ambitious plans to destroy the New Order. I haven't seen him do anything yet, but as Ledrian Saisima proved, these kinds of plans can take years to come to fruition. Rihanna Ashlie offered a strange analogy to describe the Code: "You can coat chocolate in candy, but it's still just chocolate in candy." I actually like this comparison a lot. The Code is like chocolate coated in candy. From sweet tooth to sweet truth! 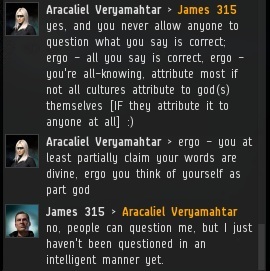 I don't know what's going on, but lately a lot of miners have been accusing me of claiming divinity or godhood. I haven't even come close to doing that yet. 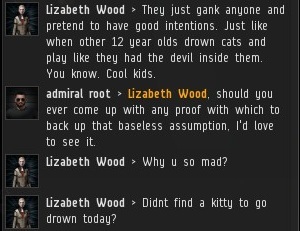 It's always nice to see concerned citizens of highsec telling others about people's connections to the New Order. It's the ultimate endorsement. I'm pleased to say that the New Order has beaten the odds: Despite having hundreds of active Agents, not one of us has ever been caught abusing animals. Other EVE organizations must be jealous. 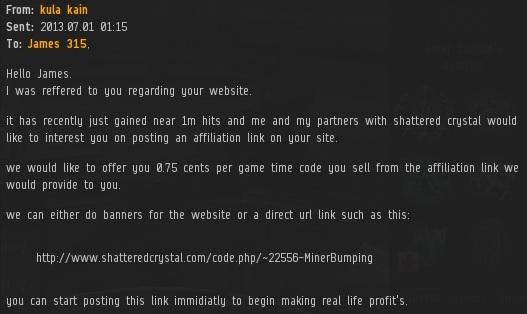 Even now, there are highsec miners who claim they contribute more to the community than bumpers do. But I have to wonder--would more carebears be interested in bumping careers if it could be done while AFK? Pure Sadness lived up to her name when she complained about being ganked by an Agent of the Order. 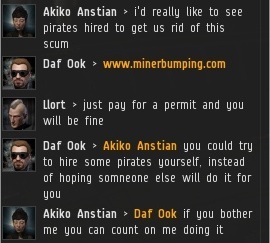 Pop Quiz: A 7 month old character claims to be "new" and flies a 36 million isk Retriever (fitted for maximum cargo and minimum tank, naturally). 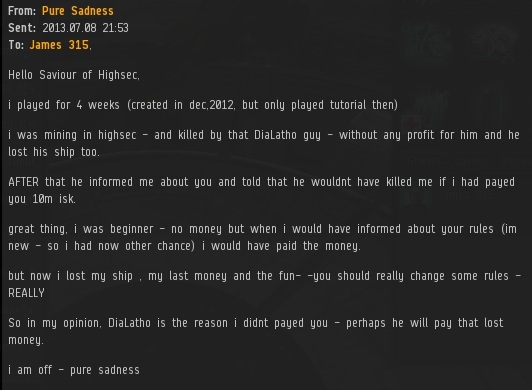 Did she fail to pay for her 10 million isk permit because she didn't have the money, or because she was greedy? Answer below. Answer: She was greedy. Miners who follow the Code never get to a state of "pure sadness". They exist in a permanent state of bliss. Dude, I want to hear what happened to your bio! Yet another awe inspiring post ! 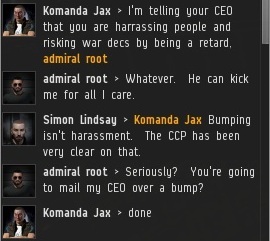 It is sites like these that make Eve Online such a highly rated MMO, and what CCP does in return? 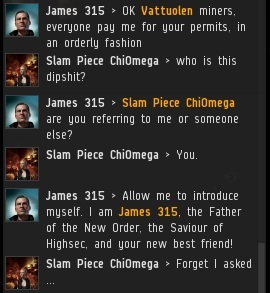 They remove James 315's bio... Outrageous ! Thanks James for everything you do. 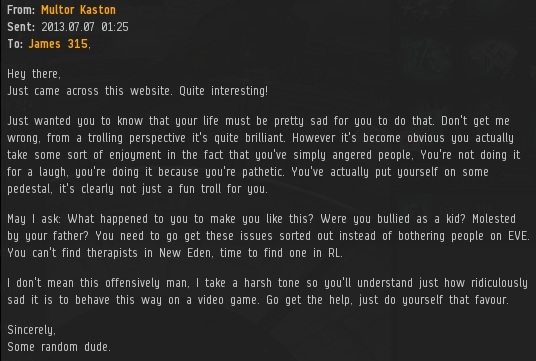 I'm not playing EVE at the moment but I love to read your blog. Sometimes those carebears make me angry with their attitude and smack-talking, but reading your clever comment after the screenshot always make me smile again. Never ceases to amaze me how these miners somehow think their "gameplay" is somehow more noble or superior to others. "what do you do all day" could be turned right around to sitting still in your ship moving imaginary space rocks. "Gehay" indeed. I swear I could take two decks of cards, arrange them into 5 arbitrary piles, and declare myself the winner and get more "gameplay" than these miners.